It’s the current ‘buzzword’ – content marketing – and it’s one of the easiest ways to reach out to new customers. 15 Things Your Customers Wish You Knew About Content Marketing! Hi there, thank you so much for taking the time to come and join with me. Number 1: The sales cycle begins with the research. The discovery of what to buy. Here’s the thing, we have two different types of customers. Those who know what they wanna buy, they’re just looking for who do I buy it from? And then there are those who’re still trying to discover exactly what it is that they wish to purchase and this is the type of content that so many websites miss out on. Remember, the sale cycle begins with the research, the discovery process. People trying to decide what to buy. Number 2: A well written blog gives customers the number one reason to return to a website. Imagine you got a customer, they’ve invested the time, they’ve invested the money, now you need them to come back, now you need them to fall in love with you not just a one-time purchase but to also share your content with their friends, with their own tribe to build your circle of influence. A well written blog is the number one way to get customers to return to your website. Number 3: E-mail, it’s not dead. Customers love to read permission based e-mails that they’ve given permission to receive and that’s what it all comes down to and this can apply to both stages of the buying cycle. The discovery process and the actual purchase process not to mention after sale as well. E-mail. E-mail is still a great way to reach out to people with what they’ve asked for and of course, they’ve given you permission for them to receive it. Number 4: Video is second only to personal referral in reference to building trust in the buying cycle. Oh, this is so important that you use video on your website. No other way, there is no other way of building trust better within that buying cycle. Number 5: There are two types of content. First contact content and build and buy content. Let me explain that very simply. It’s an extension of what we soar in number 1. First contact content is the type of content we want people to see the very first time, they make what? Contact with our business. And that type of content needs to be written differently to those that build trust. This video for example, it’s really good for a first contact content type. It explains a range of different things and is a great way to reach out into the market place to bring people back. But then we have build and buy content. Now build and buy content is the type of content that builds trust that leads towards the sale that goes more in depth to an individual’s needs. It answers questions, it builds belief and of course that trust factor is the most important thing. Number 6: Business to business. Customers love case studies. Yes, if you’re selling business to business it’s vitally important that you also use case studies. What you’ve done with other people, what others are doing in your industry to help build that trust factor. Number 7: Business to consumer customers, they love what? Social proof. Now this is a term that you’ve heard a lot of. I’m sure of it and social proof is a vital part of the way we do business these days. Once upon a time it was just testimonials but now we need to see other people talking about the things that we’re interested in to build that trust factor. Number 8: Social Media free is best for first contact content. The free social media remarketing will then draw people to the build and buy content. I know it sounds a little bit “Uhm, let me quite get my head around that” but imagine this, a video such as this one, well- written article, bullet points on any issue, it goes out to social media through the free channels. It gets shared, it gets read, it brings people to you. Then what? Then you use remarketing through social media, the fee, the paid aspect to bring people back to your primary pages, your build and buy content. To build trust or have them actually buy from you. Number 9: Quality content marketing builds customer loyalty. Both before and after the purchase for some reason too many business owners these days, I think it’s because they read the internet marketing things, everything that they do is focused on the actual sales, focused on the funnel, focused on getting people to buy. But don’t forget there’s an amazing buying opportunity again after the purchase. And so the content that we create, that we share needs to address both before, during and after the purchase. Because there is no better way to get a qualified referral to have someone recommend you to their tribe than after the actual purchase. Number 10: Up to 70% of customers use the content on a business website to make a buying decision without even talking to the business especially if you’re running an e-commerce site. 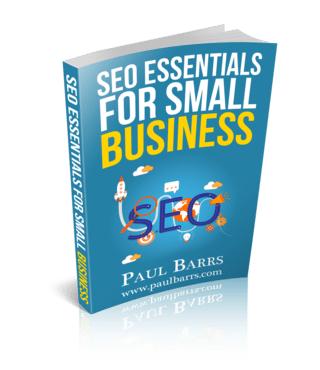 It may even be higher up to 70 % of customers will read through everything on that website and make their buying decision and they haven’t even had contact with the business or the business representative or owner. Could that be you? Could you be in that situation? Does the information on your website reach out to people, enough for them to be able to make a buying purchase? Be a good thing to know, don’t you think? Number 11: The average users spend 80 % more time on a website using video than on one without. Now video is amazingly important tool in the informative process particularly when it comes to build and buy but also greatest on demonstrating here for that first contact content. If you wanna keep people on your site longer, you need to give them a reason to stick around. Number 12: An extension of 11. Video is the ultimate sticky factor for a website. But… but most people can read faster than you speak on average because we don’t actually read word for word we scan. We browse, we look at the headlines. So with every video that you put on to your website, I believe you should also have a transcript and yes if you are watching this on my YouTube channel right now or syndicated through another website, you will find the transcript with the bullet points right there for easy reading. Number 13: In a recent survey, more than half of all consumers said that watching product videos, listen to this… were the major tipping point in that buying process. Remember what I said right up front, two different types of customers : those who know what they want, they’re just trying to decide who they wanna actually buy it from and then there are the rest, the 80% in the discovery phase. They’re yet trying to decide what they want to buy. Wouldn’t it be a wonderful thing if you could grab those people bring them in to your business, what do you want to buy? Here are the options, here are the choices, then when they make that decision, “Ah this is what I want to buy“, they buy from you because you’ve done everything in the sales process and you’re using video which becomes that major tipping point. Number 14. Almost there in the 15 things that your customers wish you knew about content marketing. Number 14: Articles with images are far more effective at informing than those without. And here’s the thing, that’s not a brainstorm. We all should know that. I’m sure you do. However, not just generic images, not just things you snatched off the web, find images which are specifically related to the content and if you can, the consumer or the web visitor who is visiting. So you got your content and you got your images, telling a story together. That’s exactly what you need. Number 15: And the final in the 15 things that your customers wish you knew about content marketing. Customers love it when they feel like a brand just gets them. Wouldn’t that be amazing? You go to a website, you read the content, you maybe look at the video, you hear the voice behind the site and you go “Ah, yes they get me. They understand what it is I’m trying to achieve“. And when you get to that point that is the ultimate way to build a tribe and truly that’s what content marketing is all about. It’s about building a tribe of followers. Those who are pre-sale, they’re in that discovery process, those who are in the buying process in the cycle right now and those who had completed the buying cycle, they purchase from you and your bringing them back, helping them, encourage them to share to your friend’s site, to their friends and their family. That’s building a tribe. Having them share your content to their people who come and follow you. Okay folks, my name is Paul Barrs. 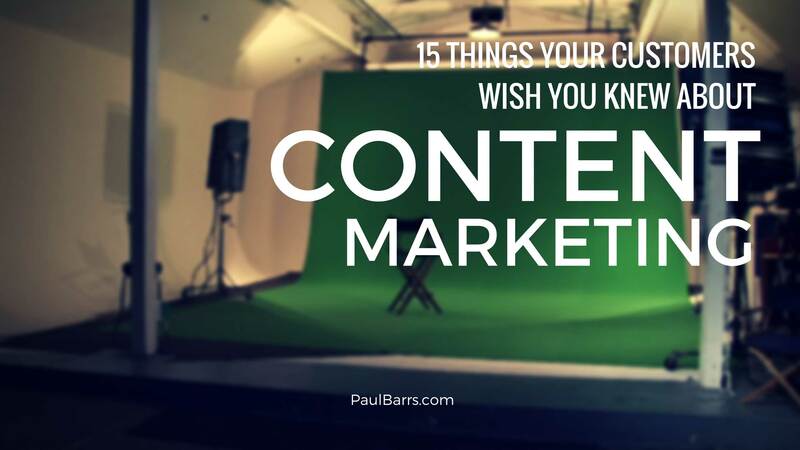 Thank you so much for joining with me, 15 things your customers wish… wish you knew about content marketing. What I’d like to see for you is to put some of those things into action. I know you’ll get better results when you do. Bye-Bye.